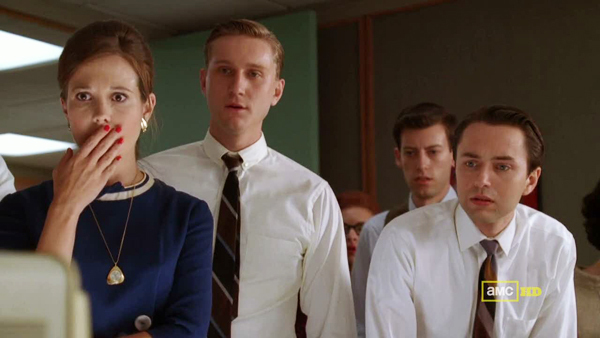 Still from Mad Men, Season 3, Episode 12. Kennedy’s assassination is reported. In the abstract for her contribution to the second issue of Moving Image Review & Art Journal (MIRAJ), Stella Bruzzi states that she “explores the idea of ‘approximation’: the layered understanding of historical moments and events via works whose aim is to approximate reality and all its ramifications, rather than more straightforwardly to represent it.” In focusing on artistic works that (re)stage the real events of the September 11th and of Kennedy’s assassination, Bruzzi is specifically examines traumatic historical moments. The representation and immediate aftermath to ‘9/11’ as it is commonly known, had global impact, making us all more acutely aware of the multitude of issues attached to factual representation as a straightforward route to historical understanding. Even as we watched the devastating images of the planes careering into the Twin Towers, we might legitimately have been struck by the realization that, alongside the proliferation of live images had come an even greater need for the assimilation, contextualization and, most importantly of all, narrativization of factual footage. Bruzzi connects the notion of approximation to that of haunting, introducing this first with respect to Gerhard Richter’s painting of the Twin Towers, titled, September (2002). According to [art critic] Robert Storr, having ‘initially rendered the full explosive power of the hijacked planes’ collision with the skyscraper in bold tones and colours, Richter felt defeated by the failure of his work to measure up to the vividness direct photographic documentation of that collision achieved’ (2010: 47). What he ultimately produced was a vision of 11 September 2001, as ‘the ghost of a ghost’ (Storr 2010: 50), a hazier, more fragmented image, in which artistic technique… is an essential element of not only the painting’s style but of its critique of the events it depicts. This ‘ghost of a ghost’ has a somewhat complicated, perhaps even inverted relationship with simulacra. It considers the position that a ‘trace’ holds in relationship to ‘representation’. It may be possible to represent something that never existed, but the vaguely rendered yet palpably felt presence of a cultural ghost can only refer to a real—usually traumatic—event. In its explicit ambiguity, an approximation refers more directly back to something else, something that actually exists, or something that once existed. …it provides the tools for us to not just focus on the assassination, but to examine more broadly the ‘failure’ of factual footage as the reliable purveyor of accurate and complete information. Conner’s collage method interrogates an event but also the ways in which information is processed, contextualized and endlessly reinterpreted or reframed. I would like to reframe a[n].. impulse towards narrativization or filling gaps as emotional, complex and layered – a desire to complicate, to dispense with linearity and causality, to view complication as a route to not just interpretation but also assimilation. We are no longer satisfied with the mere compartmentalization and ordering of data – things can continue to exist in collision or in contradistinction to each other. ‘Atrocious images’ haunt us not because their horror is finite but quite the opposite: because they relate to, recall and reawaken other images and memories and will themselves never reach a point of definitive closure. Stella Bruzzi is Professor of Film and Television Studies at the University of Warwick. Her most recent book is Men’s Cinema: Masculinity and Mise-en-Scène in Hollywood (Edinburgh, 2013) and she is now writing the book Approximation: Documentary, History and the Staging of Reality (Routledge, 2015).